Michael D. Borer, 82, of Tiffin, died at 1:53 p.m. Sunday, May 20, 2018, at Mercy Health – St. Vincent Medical Center, Toledo, surrounded by his loving family. Michael was born Jan. 11, 1936, in Tiffin, to Fred and Dorothy (Fox) Borer. He married Geraldine “Gerry” Boff June, 29, 1957, at St. Wendelin Catholic Church, Fostoria, and she survives in Tiffin. Other survivors include two sons, David (Deborah) Borer of Tiffin and Fred (Stephen Wills) Borer of London; two daughters, Deb (Mark) Reamer of Tiffin and Denise (Michael) Brickner of Plain City; seven grandchildren, Andrea Reamer, Dr. Nicki Reamer, Daniel Reamer, Kiele Reamer, Allyson Brickner, Griffin Brickner and Matthew Brickner; a sister, Mary Ann (Paul) Gaietto of Tiffin; a sister-in-law, Eileen Borer of Tiffin; three stepgrandchildren, Valerie Feasel, Stephanie Johnson and Andrew Bish; and seven stepgreat-grandchildren. He was preceded in death by his parents and a brother, John Borer. Michael was a 1954 graduate of Tiffin Columbian High School. He had worked at Wollin Products of Clyde as a tool and die machinist. He was a member of St. Mary Catholic Church (where he often led the rosary), K of C, Eagles and Silver Sneakers. Michael’s interests were hunting, fishing, sprint car racing, NASCAR, gardening, birding and shooting. He had recently received his concealed carry permit and was the best shooter in his class. 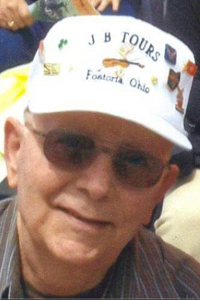 He was an avid Cleveland Browns and Ohio State fan and enjoyed spending time with his family. Visitation for family and friends will be 4-8 p.m. Thursday, May 24, 2018, at Traunero Funeral Home and Crematory, 214 S. Monroe St., Tiffin, OH 44883, (419) 447-3113, with a wake service at 3:30 p.m.
Prayers will be said at 1:30 p.m. Friday, May 25, at the funeral home, followed by a funeral Mass at 2 p.m. at St. Mary Catholic Church, Tiffin, with the Rev. Gary Walters officiating. The rosary will be recited 20 minutes prior to the service at the church. Burial will follow in St. Mary Catholic Cemetery, Tiffin. Memorial contributions may be made to St. Mary Catholic Church and American Heart Association. For directions, out-of-town flower orders, to view the celebration of life video or to offer condolences to the family, go to www.traunerofuneralhome.com.